"Zucchini, corn, and onions combined with chopped bacon and cheese. A quick and easy way to use some fresh veggies from your garden!" Place bacon in a large, deep skillet. Cook over medium-high heat until evenly brown. Reserve 1 tablespoon of drippings. Drain bacon, chop, and set aside. Heat the bacon drippings in the skillet over medium heat. Saute the zucchini, corn, and onion until tender but still crisp, about 10 minutes. Season with pepper. 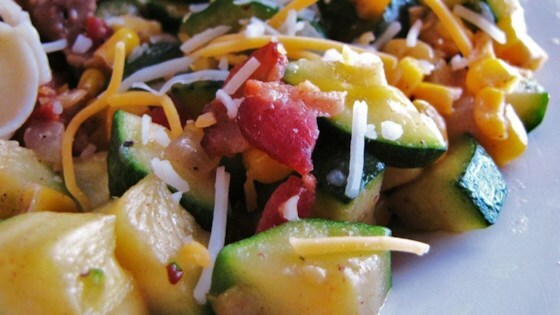 Spoon vegetables into a bowl, and sprinkle with chopped bacon and shredded cheese. Quick & fresh veggie saute! You may substitute frozen corn for the fresh corn, if desired. Well, an interesting combination, but not really that good. I don't think I'll try it again, and it was grosse for leftovers...oh well, gotta try something once, right? Fantastic! Everyone loved it even my brother who despises vegetables. The cheese seemed unnecessary and I will probably leave it out next time. Super easy and very refreshing. I used canned corn, drained, and it turned out great. For a little added crunch I added some french fried onions when served. Really quite tasty! The bacon lends a nice taste throughout the veggies. I used frozen corn and broccoli and fresh onion. I will make this again.